Forum Energy Technologies has moved to expand its operations in Europe by appointing a new single distributor for its extensive fleet of subsea vehicles across The Netherlands and Belgium. Seascape Subsea Technology BV will represent Forum Energy Technologies for the sale of the company’s range of remote operated vehicles (ROV’s) in the two countries, including its recently launched electric ROV, the XLe Spirit. Designed and built in-house at Forum’s Kirkbymoorside facility in Yorkshire, the XLe Spirit is the first offering from the company’s new generation of electric observation class ROV’s. Malcolm Johnston, Forum’s Sales Manager subsea vehicles, said: “It’s important that we work with the best and most well-respected partners in-country. Seascape Subsea Technology BV provides us with another strong channel complimentary to our existing framework to deliver Forum’s world-class range of reliable and well-built ROVs. Hull to Hull (H2H), an EU-funded research project established to develop technical solutions for safer navigation in close proximity of other stationary or moving vessels and objects, is in its Concept Definition phase and will move on to the Technology Adaption and Integrations Work Package (WP03) this summer. H2H was established in November 2017 to develop solutions using the European Global Navigation Satellite System (EGNSS), EGNOS and Galileo, that can enhance safety in busy waters and during close maneuvering, helping mariners to take the correct navigation decisions and creating the fundamental conditions for autonomous vessel navigation. H2H aims to create a system that will allow proximity zones to be set for own vessels as well as neighboring objects, with high precision and high integrity. H2H focuses on solutions for measuring the location and orientation of a vessel and creating a 3D digital twin representing the vessel’s hull, which is linked to a coordinate system, e.g. WGS84. This data can then be used as an input to an autonomy controller. H2H will also support manual navigation, providing reliable input for the captain or navigator to make better informed decisions. This could potentially be achieved by e.g., displaying the digital twin on the ECDIS or other display systems. 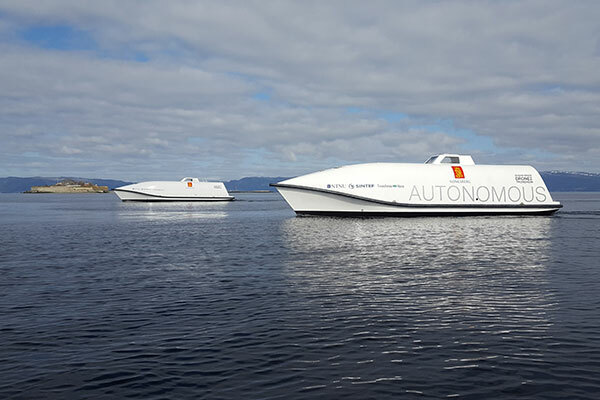 The project is coordinated by Kongsberg Seatex, a subsidiary of Kongsberg Maritime, developing solutions for maritime sensing and connectivity. Expert project partners include SINTEF Ocean and SINTEF Digital for broad research-based expertise; KU Leuven, a leading European university and expert on inland waterways navigation; and Mampaey Offshore Industries, a Dutch company specialized in towing, berthing and mooring systems. H2H is divided into nine work packages, of which four are led by Kongsberg Seatex. The pilot system will be developed in WP03, where the main objective is to define precise sensors and communication systems, and develop an integrated solution based on the best available technology. The solution will be implemented using protocols and 3D models described in the concept. The project will also research specific needs related to auto-mooring and inland waterways, perform lab testing of various sensors and technologies and develop test scenarios for demonstrations scheduled for 2019 and 2020 in Norway’s Trondheimsfjorden, in Rotterdam harbor and inland waterways in Belgium. Shell is the operator for production license 373 S in the North Sea. PSA has now given the company consent to drill exploration well 34/5-2 S. The purpose of the well is to investigate a prospect named “Tyttebær”. This location is around 11 kilometers south-east of the Knarr field and 129 kilometers west of Florø. Water depth at the site is 387 meters. The drilling operations will begin between June and August 2018 and are expected to last for 92 days if hydrocarbons are proved, and 58 days if the well is dry. 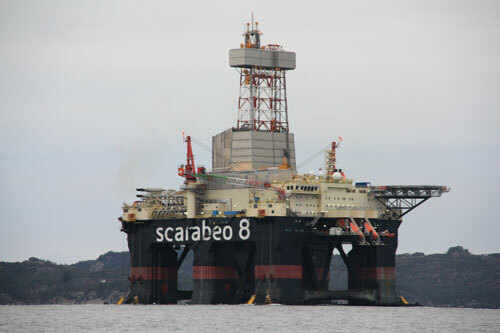 Drilling is to be carried out using the Scarabeo 8 mobile drilling facility. This is a semi-submersible drilling facility of the Moss CS50 MKII type, operated by Saipem Norge. It was built in Russia and Italy and commissioned in 2012. The facility is classified by DNV GL and registered in the Bahamas. The 22,000-tonne topside for the drilling platform was lifted into position in one single lift on the Johan Sverdrup field last weekend. Equinor and the Johan Sverdrup partners are the first users in the world of this ground-breaking technology. On Thursday 31 May the topside for the Johan Sverdrup drilling platform sailed from the Aibel yard in Haugesund to Bømlafjorden at Stord. Here the 22,000-tonne steel structure was transferred from the barge to Pioneering Spirit, the world’s biggest heavy-lift vessel. All set for the eleven-hour journey to the jacket waiting for its topside on the Johan Sverdrup field. After initial preparations, the actual installation job took only three hours. This makes it likely the fastest ever installation of a large, fully completed topside. The second of four platforms in the first development phase of the giant Johan Sverdrup field is thus installed. “This is an important milestone in the Johan Sverdrup installation campaign. Two of the four Johan Sverdrup platforms are now in place. The power cables to the field were rolled out last week, and so far, the installation of Norway’s biggest oil pipeline has gone very well, so this is definitely moving in the right direction,” says Trond Bokn, senior vice president for Johan Sverdrup at Equinor. “At the same time, much work remains, and we must maintain extra focus on safety and quality in the execution phase. But we can breathe a bit more easily now that the drilling platform is installed – this is the first ever such operation in the world,” Bokn adds. Total and its partners have taken the final investment decision to launch the Zinia 2 deep offshore development in Block 17, 150 kilometers offshore Angola. The Zinia 2 project will have a production capacity of 40,000 barrels per day (b/d), sustaining Pazflor field production, on stream since 2011. 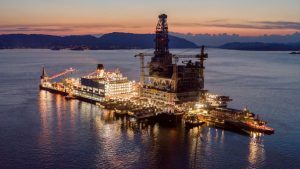 Zinia 2 is the first of several possible short-cycle developments on Block 17 that will unlock its full potential by connecting satellite reservoirs to the existing floating storage, production and offloading (FPSO) units. Zinia 2 comprises nine wells in water depths ranging from 600 to 1,200 meters, tied back to the Pazflor FPSO with a budget of US$1.2 billion. Total operates the Block 17 with a 40% interest, alongside affiliates of Equinor (23.33%), Exxon Mobil (20%), and BP (16.67%). Sonangol, is concessionaire. It has four FPSOs — Girassol, Dalia, Pazflor and CLOV. In 2017, its production averaged 600,000 b/d. Shell Offshore, Inc. (“Shell”) announces a large, deep-water, exploration discovery in the Norphlet geologic play in the U.S. Gulf of Mexico with its Dover well (100% Shell). The Dover discovery is Shell’s sixth in the Norphlet and encountered more than 800 net feet of pay (244 meters). The discovery is located approximately 13 miles from the Appomattox host and is considered an attractive potential tieback. Shell’s Appomattox host has now arrived on location in the U.S. Gulf of Mexico and is expected to start production before the end of 2019. Shell’s major, deep-water hubs are well positioned for production expansion through near-field exploration and additional subsea tiebacks. The company expects its global, deep-water production to exceed 900,000 barrels of oil equivalent per day by 2020, from already discovered, established areas. The well was drilled in Mississippi Canyon Block 612, located approximately 170 miles (273 kilometers) offshore southeast of New Orleans, in a water depth of 7,500 feet (2,280 meters) to a total vertical drilling depth of 29,000 feet (6,780 meters) measured depth. Appomattox host platform is owned by Shell (79%) and Nexen Petroleum Offshore USA Inc. (21%).